This popular fairy tale has lots of versions and I mean lots – over 700. Cendrillon by Charles Perrault from 1697 being the most well known after Disney transformed it, what we know as the 1950 animation Cinderella. Perrault introduced the pumpkin, the fairy godmother and the glass slipper (gold in the Grimm version), the Grimm’s on the other hand present a much more sinister tale, as when they started publishing they were aiming for adult readers and scholars not children. If you don’t know the Grimm’s Cinderella version it is certainly worth a read. Unlike Perrault’s, their Cinderella tale is as much a fable as it is a fairy tale. Their version places a strong emphasis on deception and humiliation. Good dramatically triumphs over evil, the evil doers (the step sisters) lose their eyesight so they cannot perceive good or their own wickedness, whilst Cinderella’s purity and kindness does lead her to a happy ever after. Still sounds like the Disney?…Just wait till you get to the body parts being cut off. In respect to my design I particularly enjoyed creating it as I’m a big shoe lover, I could start a shop myself from my own wardrobe! 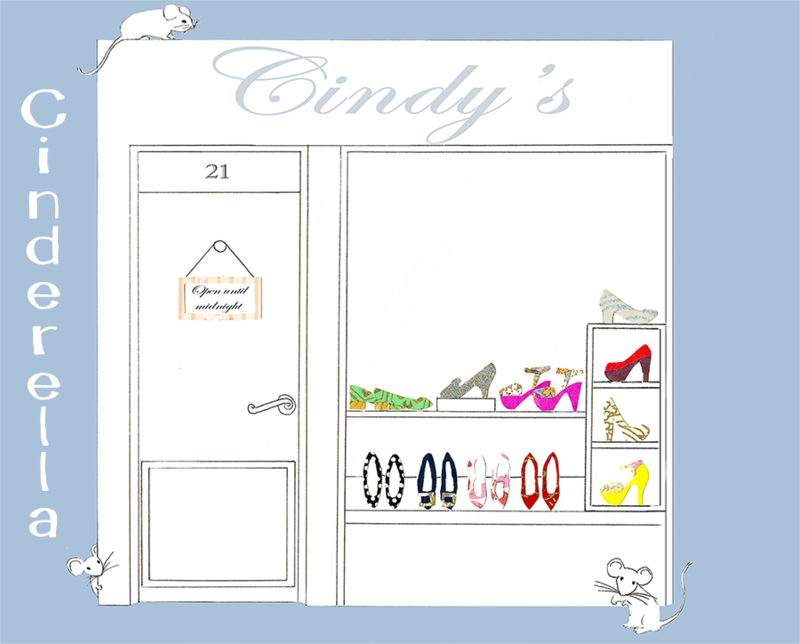 With this one I combined small elements from the different versions, for example the shop number ’21’ connects to Cinderella’s individual fable number in the Grimms collection whilst the door signage plays to the time stamp of the fairy godmother’s magic.